Request for reproduction and downloading of Jenny Holzer works should be directed to Artists Rights Society (ARS), New York. James Cohan Gallery is pleased to present a group show titled Air featuring 29 artists from the 17th century to the present; each musing on the invisible yet physical element of air. The notion of air, aside from being the one factor that distinguishes earth from all other planets, continues to shift in our mind with the advent of technological innovations (e.g. wireless communication) and environmental concerns (ozone layers, global warming). 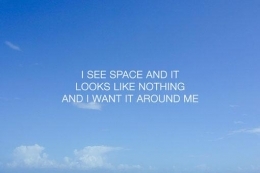 The exhibition explores "air" in three thematic premises, the physical/perceptual notion of air, conceptual musings on air, and air as a metaphor. 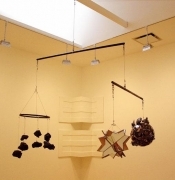 Among the many works included in the show are Marcel Duchamp's 50 cc ampoule of the air of Paris housed in his Boite-en-valise from 1938, Piero Manzoni's pneumatic sculpture from 1959-60, Corpo d' Aria (Air Body), consisting of a deflated balloon, a rubber hose and tripod, and Yves Klein's infamous fiction Leap into the Void (1960). Each of these works is critical to the contemporary dialogue on this subject. 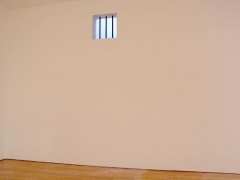 Robert Gober's Prison Window(1992) installation, in which an illuminated sky-filled window diorama with hand-forged metal bars is inset into the gallery walls, and Jeff Koons's meticulous bronze castAqualung (1985), further elaborates on the confinement and absence of air. Like Manzoni, who was preoccupied with the artist's breath, Bill Viola's Nine Attempts to Achieve Immortality (1996) is a black and white video in which the artist holds his breath for as long as possible, nine consecutive times. 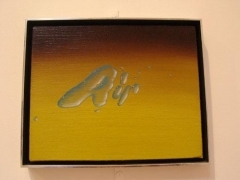 It is a meditation on life and its fragility, as a cathartic gasping for air breaks the artist's silence. In contrast, Marina Abramovic's video Breathing In, Breathing Out (1977), renders the idea of resuscitation as contradiction; she and her collaborator Ulay breath into each other's mouths to the point of unconsciousness. 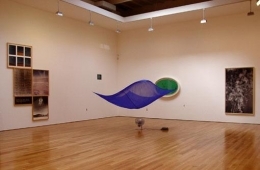 Janine Antoni's new work Sigh (2003), a curtain caught in a momentary breeze comments on the passing of time and memory, while Erick Swenson's wind-swept hybrid animal lays bare physical manifestations of emotional states. Dennis Oppenheim's 1973 Whirlpool (Eye of the Storm), a five-panel photo document, an early conceptual work in which he hired a skywriter to "draw" a tornado form. The whirlpool existed only as long as the winds would sustain it. 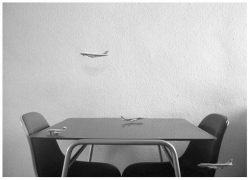 Oppenheim makes time, site, duration and potential chaos his subjects. 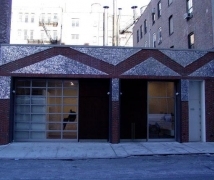 On the exterior of the gallery is an architectural installation by artist Howard Goldkrand. He has mounted metal sequins to the façade of the building in a geometric configuration related to patterned sound waves. The sequins shimmer with the air exhibitionss while speakers, mounted to the gallery entrance, transmit random electronic signals picked up in the airways by two rooftop antennas. 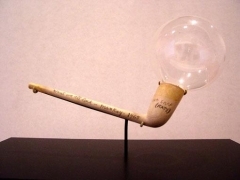 In addition to inviting contemporary artists to be involved in the project, historical representations of atmospheric conditions will be exhibited that illustrate how the idea of "air" has changed quite dramatically over the last few centuries. 19th century painters such as Gustave Courbet, John Constable, Thomas Cole, Arthur Parton, J.M.W. 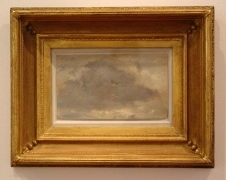 Turner and R.A. Blakelock represent open skies and the emotional states sunsets, sunrises and weather conditions can impart. 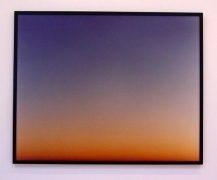 Richard Misrach's photograph, from 1997, titled 10.14.97, 6:49 pm. explores these same issues through a contemporary lens.